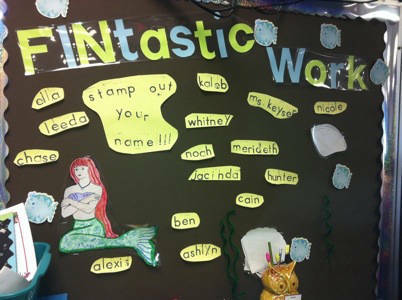 Need some ideas for your Writing center in Kindergarten or First Grade? Students can choose from a variety of writing materials to practice writing letters, names or words. I have my students work on writing workshop stories (Lucy Calkins), theme related stories (season, events), and other writing activities ( letters, lists, puppet show/plays, greeting cards, comics). Use a date stamp on each journal page. I buy mine from Staples, Amazon, or Vista Print. Provide a variety of writing utensils (colored pencils, markers, crayons) and writing materials. The students love post-it notes and the little free notebooks I get from conferences. Provide stencils and stamps. Get these at yard sales, stamps can be very expensive. See bulletin board example. Provide Dictionaries and Thesauruses in the writing center. Snip off corner of pages they have already used and it will be easy for them to find the page they are supposed to write on next. This is a great little trick I learned from a teammate. ~playdough, shaving cream, hair-gel or fingerpaint in sealed baggies, wikki-sticks, or sand on a tray. Journal writing: Students may write on a specific topic given or own choice. Journal Starter: Have a label on a spiral notebook that says.. “A dream I had…”, or “Once I got hurt…” Then have the students only write stories about that topic, it becomes a class story book. To read more about these, click here to see my other blog post. Mailbox/Post office: Students can write letters to their friends and family and put in a mailbox. Science Observation Journal: Students examined displays and then draw and record what they see. Art Book: Students may create their own books using pre-made books or books that they make themselves.